Also known as fever blisters, these sores are fluid-filled wounds brought about by the herpes simplex virus type 1 infection. The following treatments for cold sores can limit their frequency and also shorten its duration. These sores usually clear in a couple of weeks even without treatment. In cases where the symptoms are severe, topical medication may be prescribed. Lidocaine is used to relieve pain, while benzocaine (Zilactin) can shield sores from irritation and trauma. Oral antiviral medications can reduce the sore duration if taken early. They include valacyclovir (Valtrex), acyclovir (Zovirax) and famciclovir (Famvir). An antiviral medication can be used to stop recurrence. These will be prescribed if you get these sores often. Antiviral drugs are used if a major illness occurs while there are sores. Consult your doctor before taking any antiviral medications. There are many symptoms, including blisters. These blisters are small and have fluid inside. These painful blisters appear on a raised, reddish part of the skin. Usually these emerge near the mouth. They can also appear on the lips, chin or fingers. The blisters can also surface on the mouth’s roof or the gums. Sometimes they also come out on the underside of the tongue. Prodrome (tingling or pain) precedes the blisters by a day or two. 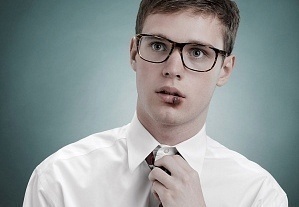 On the average the sores last from 10 days up to two weeks. A week after exposure to the virus, the symptoms will manifest. Sometimes it takes 20 days. After the blisters form, breaking and oozing follow. It is replaced by pinkish skin. This does not leave a scar. See your doctor if he sores do not heal on their own in two weeks. Medical attention is also necessary if your immune system is weak. You should also talk to your doctor if the irritation is near the eyes or the symptoms are intense. Do not self prescribe if the symptoms are severe; consult your doctor first. Herpes simplex virus type 1 is responsible for these sores. 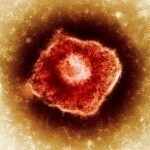 Herpes simplex virus type 2 is the one that causes genital herpes. However, both strains may cause sores around the face. One gets the sores from an infected individual. Transmission occurs from using the same towels or eating utensils by an infected person. This may also be spread by kissing. After an episode, the virus will remain inactive in the cells around your skin. This may come up again as an infection, usually near the original location. Recurrence may be triggered by stress, fever, menstruation and exposure to the sun. Knowing the triggers can prevent a recurrence. Note: these sores are not canker sores. Canker sores are not contagious. 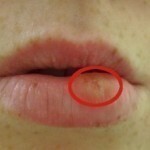 These canker sores are caused by ulcers. These appear around the mouth’s soft tissues. They are not caused by the herpes simplex virus type 1. Knowing the treatments for cold sores is crucial. You may not need them in most cases, but it pays to be aware so you can get the correct treatment.